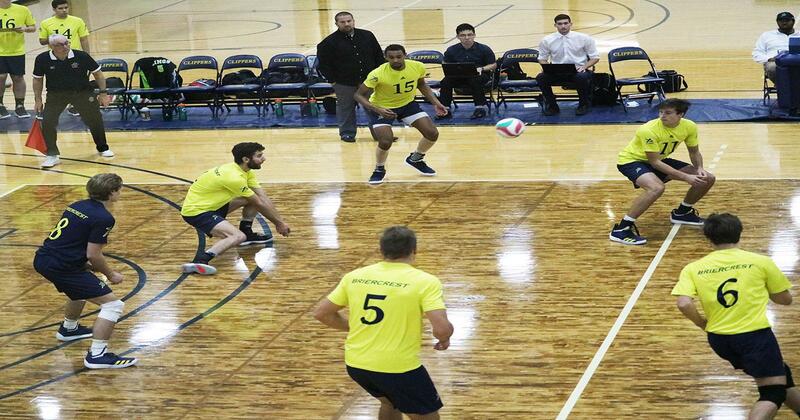 The men’s team played the Ambrose Lions in a rematch Saturday afternoon, the result was a Clippers win in three sets. Scores coming to 25-17, 25-15 and 25-18. The first set started off with a Clippers drive to win, pulling ahead with a 13-8 lead halfway into the set. The Clippers held their ground and won the set 25-17. The Clippers came with heat off the start of the second set, up 13-6 halfway through and being able to maintain the lead the lead to a 25-15 set win. A huge part to this contribution was captain #5 Mitch Erickson with 9 digs and 8 kills. The fourth set was tight, the Lions looking to keep the match alive. Midway through the set the Clippers were up 13-11. The Clippers went on for a 9-4 run taking the set 25-18 and finishing the match and weekend sweep. Player of the game for Briercrest #7 Javier Alvarez who obtained 7 digs, 5 kills and 2 aces during the game. Briercrest ends the first half of the season 6-6, takes on Medicine Hat College in the New Year on January 3 at 8:00pm, watch in Caronport, SK or on ACAC TV.